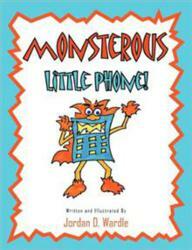 A full-color picture book is set to amaze and entertain young readers as author Jordan D. Wardle pens Monstrous Little Phone!, made available through Xlibris. The little boy misses the time when his daddy would play with him, run around with him, and tuck him into bed. Can he have his daddy all to his own with that monstrous little phone around? The answer unfolds in this children’s book. Monstrous Little Phone! is not only a tool that helps youngsters to read, but is also a striking reminder to parents: not to compromise their children’s needs with work. For more information on this book, log on to http://www.Xlibris.com. Members of the media who wish to review this book may request a complimentary paperback copy by contacting the publisher at (888) 795-4274 x. 7479. To purchase copies of the book for resale, please fax Xlibris at (610) 915-0294 or call (888) 795-4274 x. 7879. For more information on [self-publishing or marketing with Xlibris, visit http://www.Xlibris.com. To receive a free publishing guide, please call (888) 795-4274.